The Chinese sports shoe brand Li-Ning was recently launched in the local market ostensibly to coincide with the ongoing Thomas & Uber Cup badminton championships. So, as a foreign brand anxious to gain some share in a competitive Malaysian market, what would you do? 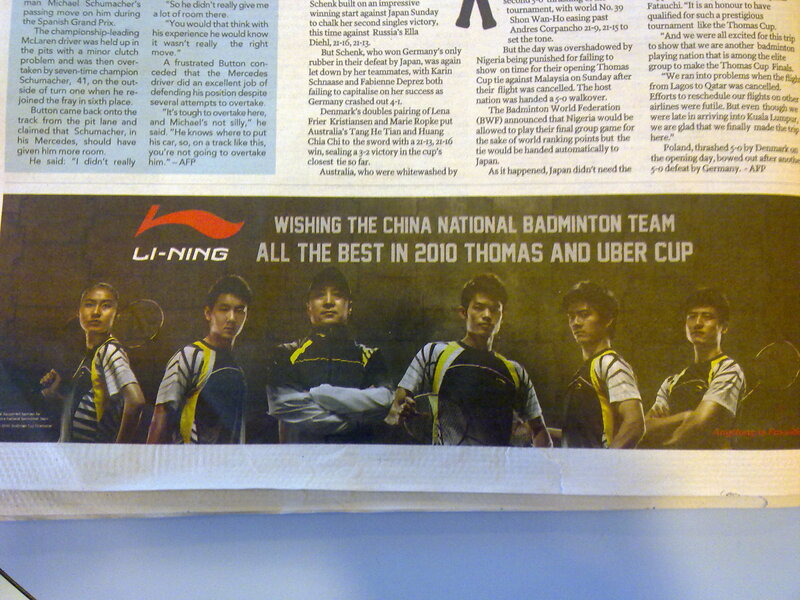 If you’re Li-Ning, you promptly take ads out in local dailies wishing the Chinese, yes you read it correctly, Chinese (we’re talking People’s Republic of & not the MCA variety) , badminton team all the best in the tournament. A stupid branding bungle which they will probably regret for the rest of their stay here. At the time of blogging, Malaysia has already lost to the Japanese (first time ever in any Thomas Cup by the way) and believe you me, every little slight will surely be remembered by sore badminton fans. Best stick with Yonex lah. Posted in Idle Thoughts and tagged badminton, brands, marketing, Thomas Cup. Bookmark the permalink.